Last week the Western media showed how it still views itself as the disapproving parent admonishing the errant Mohawk child, done through the coverage of the Kahnawá:ke Kanien’kehá:ka registry (KKR). 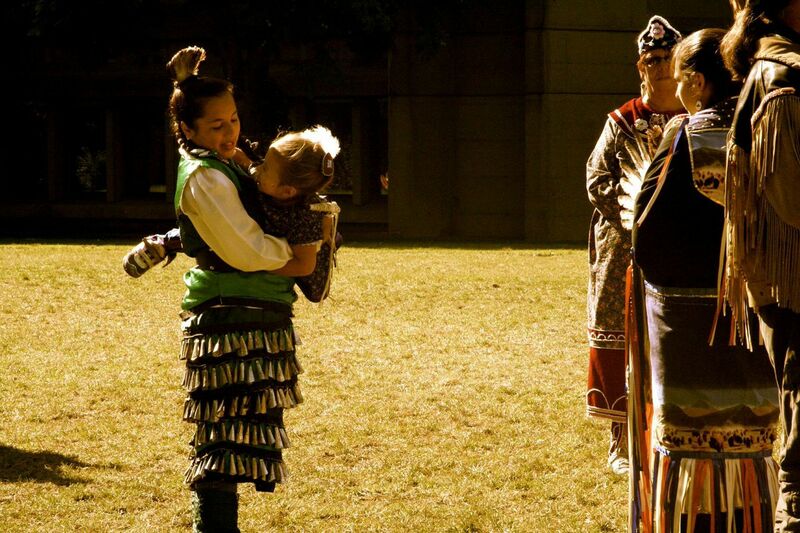 A Kahnawá:ke native holds a child at a community event on Sept. 19, 2008. The Kahnawá:ke Kanien’kehá:ka registry defines who is and is not a member of Kahnawá:ke on the basis of marriage and biological criteria. Photo by L. Lew on Flickr. This policy came into the spotlight with news of a $50,000 lawsuit brought before the Quebec courts. In it, seven members of Kahnawá:ke allege that their rights have been infringed upon and have been harassed and intimidated as a result of the KKR. Instead of throwing another Western media hat into the ring, I sat down with Orenda Boucher-Curotte, Concordia University Religious Studies alumna, professor at McGill University, and Kahnawá:ke native to see what she thought of the situation. The Concordian (C): What do you think of the media’s coverage of the lawsuit thus far? Orenda Boucher-Curotte (BC): The media has jumped on the “this is racist” bandwagon, in part because I think it allows for people to vent their own colonial frustrations. People with very little understanding of what Kahnawá:ke has been through see this as a racist policy, but they have to first understand that those who support the evictions have a deep rooted fear that colonial laws set out to assimilate and destroy Indigenous peoples. Canadians know, or should know that residential schools, reservations, the Indian Act, etc., were all policies that set out to assimilate us [the Mohawk people] into the dominant [Canadian] culture … They fear allowing non-natives to live in Kahnawá:ke would eventually further those assimilation policy initiatives … I appreciate outside media giving a voice to those affected directly, for certain. But they also have a responsibility to speak about the injustices that led us to this point. C: What has led to this point specifically? BC: Restricting our resources to the point where we end up fighting about this: the blame on that lies with the government. The government includes [the Canadian Government as well as] our own band council system; a system put in place by the Indian Act. Essentially we are in a catch-22. If we had more resources, this would not be a problem. But our own traditional laws, such as ‘The Great Law of the Haudenosaunee Confederacy’ which SHOULD supersede federal laws makes room for things like adoption and integration. C: What has been the reaction in Kahnawá:ke to both the news coverage and the lawsuit itself? BC: The reaction has been anger and frustration I think, but not all directed at those filing the suit. There’s resentment that those who would potentially make a decision on the case would be an outside court. That risks further imposing colonial laws on a community that is pushing for self-determination and self-government. On the flip side, those suing don’t have any other real recourse. C: Do you have any concluding thoughts for our readers on the situation in general? BC: All sides, and there are more than two on this issue, have strong conviction for their argument. It’s important to understand that it’s not the whole community who supports these evictions, but rather a group within the community. Many want to open up a space that encourages a dialogue where consensus can be reached, or alternatives offered. That can’t happen in one meeting, or even two. This issue has been ongoing for decades.